A Wooden Clock with 407 parts! I often hear from people interested in clock making. This youtube link was sent to me by a friend that is fluent in Japanese. He was able to provide me with a few details about this very ambitious clock mechanism. This weight driven clock has two mechanisms, one telling time and one writing it out once every minute. It was designed by a 22 year old industrial design student for his graduation project. It is called a Plock (plot+clock). Wow! 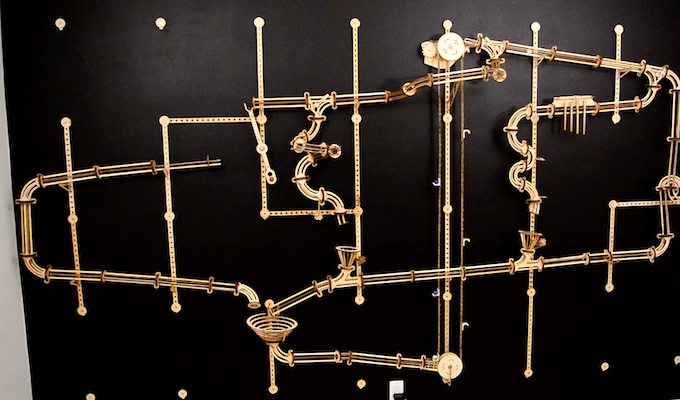 I would love to get to see this creative musical kinetic sculpture in person. There is just so much to experience here! The machine was designed and built by Martin Molin. The audio track of the performance is available here.